Wow, boys - one would never believe you were not actual brothers from the same litter you look so much alike! It is great you love each other, and your adopted momma too! How fun you are both sink kitties - not very cat likes them! In any case, you are very handsome boys, and today you are Cat of the Day for the whole world to celebrate! Congratulations again! Dear Romeo and Comet, what a handsome couple you are. Both of you looks so plush and soft, and you have adorable faces. Your pictures are precious beyond words, and they show clearly how much you two love each other. Even though you look like twins, you have very different personalities, each one lovable, sweet and special in his own way. Romeo and Comet, you are beautiful, inside and out, and I wish you and your family a great day full of celebration, and many more happy and healthy years together. Dearest Romeo and Comet, you are gorgeous, each of you and both together! What a good-looking pair of kitties, who indeed look like brothers! When I first saw your photos, I thought you were brothers, even littermates. Then I read the text and was amazed at this remarkable coincidence. You may not be related by blood, but you sure are by choice and affection, aren't you! Thank you for sharing those great photos with us. You are both extremely handsome, and your affection for each other comes through beautifully! I wish I could reach through the screen and down to Coral Springs, FL to pet you both. I can't, of course, but I know your loving and beloved Meowmie will pet you both for me . And what delightful Purrrsonalities you have! You make your dear Meowmie smile with all your energy and antics. You both love to play fetch with tin foil balls, and you fight over the sink, which isn't big enough for both of you, each day. Comet, you like to help Meowmie make her bed every day and also like to hide her jewelry. You are very loving and protective of her, and you have a Decorah Eagle glare =). Romeo, you are a lover boy, and you communicate with slow blinks. Meowmie adopted you both from shelters, and we thank her very much for going the rescue route. You are outstanding examples of the treasures to be found in shelters! You are both very affectionate. You're always together, giving Meowmie kitty love all the time. You and she all love each other very much, don't you. She says you two are priceless and she cannot imagine her life without either one of you. What a wonderful love-filled home you share! 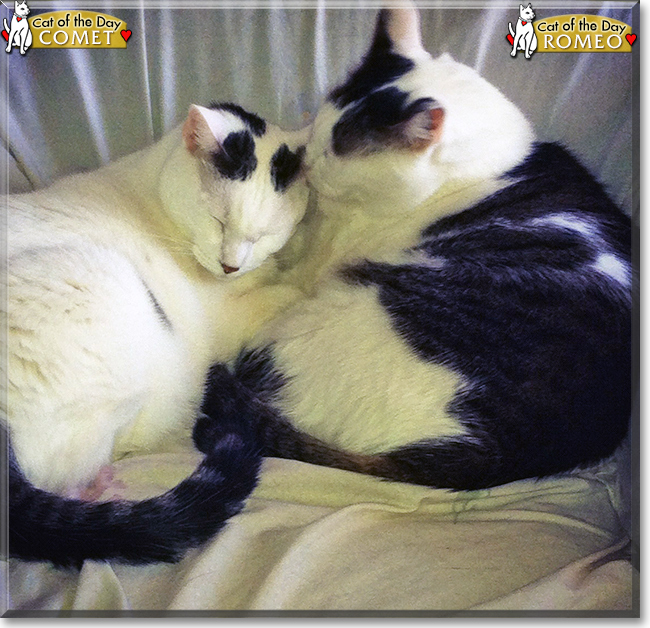 Congratulations, darling Romeo and Comet, on being chosen today's Cats of the Day! We hope you guys and dear Meowmie and all your family and friends are enjoying a fine celebration, full of fun and lovies and all your favorite games and treats. Last edited by phesina; 10-30-2018 at 05:33 PM. It's Two For Tuesday on Cat of the Day with Romeo and Comet! Hello, two kitties! You are so good looking with your white and dark fur, and your sweet faces! I can tell you are bonded! You are busy kitties, too- taking turns occupying the sink, playing with a ball of tin foil, and being loved! Comet helps each day with the bed-making, and also helps meowmie with her jewelry Romeo is a loverboy kitty giving those wonderful slow blinks! You are very precious kitty guys! 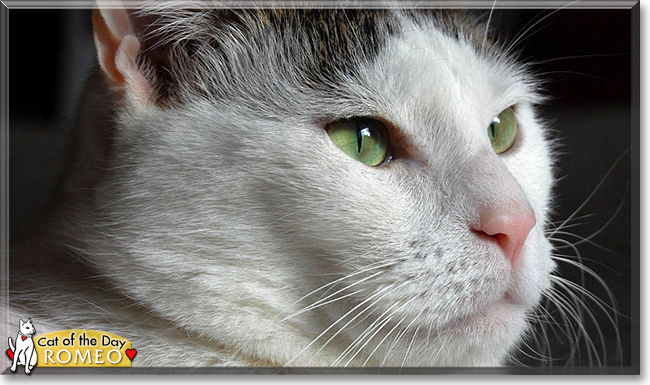 Happy, happy Cat of the Day to Comet and Romeo! Hi Romeo and Comet! Happy "two for Tuesday" Cats of the Day! Now that's what I'd call a double dose of bonded brother adorableness! (Tell your mommy you need a double sized sink! ) Hard to believe you two boys aren't blood brothers! Well, they do say everyone has a doppleganger, and I guess that applies to kitties as well! And not only are you both equally beautiful in looks, but in purrsonality as well, just as sweet and loving as they come! They are both affectionate. You never see one without the other =) I get kitty love all the time. They look alike although they are from different litters, and not related as far as I know. Both are very much lap cats. Comet is more jumpy than Romeo who is very calm, almost nonchalant about everything. I cannot imagine my life without either one of them. They are loving boys in every way. How lucky your mommy is, having you in her life! As she says, the joy and love your bring to her days is a priceless gift...her priceless reward for choosing rescue! You two truly are just as special as can be, and so very deserving of your big day of honor! Thanks for ending my day with a BIG smile, boys! Meeting you has been a real treat! Hope you're enjoying a very special Cat of the Day celebration, batting about those tin foil balls, taking turns nesting in your sink, cuddling with your mom, and each other, being loved and pampered to pieces! Lots of love, cuddles and kisses to you, precious Romeo and Comet, our very special and most deserving Cats of the Day, EVERY day! I simply adore Romeo and Comet! We were so delighted to see them both today, georgous cats in every way! Congratulations on being Cats of the Day, handsome Romeo and Comet!